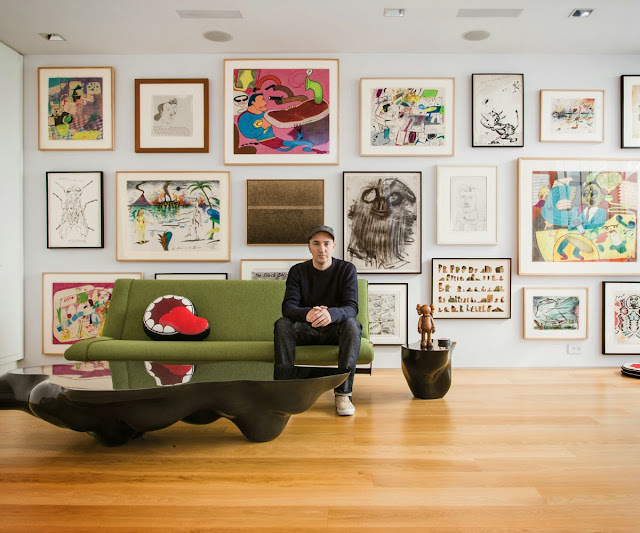 “I’m like a cat lady, but with drawings and paintings,” says Brian Donnelly, the 39-year-old artist known as KAWS. Earnings from the sales of the wildly popular, limited-edition toys based on “Companion,” a melancholic Mickey Mouse-like sculpture, enabled him to acquire art that might naturally appeal to a formally trained painter who came out of graffiti and skate culture. (KAWS was his graffiti tag, chosen because he liked “the interaction of the lettering.”) The collection reflects his refined, comic-book aesthetic in works by Raymond Pettibon, H. C. Westermann, R. Crumb, Ed Ruscha, the Chicago Imagists Karl Wirsum and Jim Nutt, and Peter Saul, whose cartoonish paintings make searing social commentary. “I have Sauls everywhere,” Donnelly says. “It’s crazy how much stuff today looks like his work.” He also owns 28 small canvases by the Japanese graphic artist Tadanori Yokoo (comic updates on paintings by Henri Rousseau), a charcoal by Joyce Pensato (a painter of cartoon figures) and a 1965 collage of comic-book cutouts by Ray Yoshida, a teacher of Nutt’s. “I grew up with a Keith Haring poster,” Donnelly says, but “I always wanted a drawing.” He has it now.